You can do a lot to help get serious bugs fixed by Apple. The “What can you do?” section of Corbin Dunn’s well-publicized blog post “The Sad State of Logging Bugs for Apple” is far too thin. The post is mostly inside baseball on how bugs are screened at Apple. Neither you nor I can do much about how Apple screens bugs. However, there is a *lot* you and I can do to get serious bugs into the hands of people who can act on them. First and foremost, write good bugs. This is fairly easy to do, though it can be time-consuming. If you’re not already familiar with bugreport.apple.com, that’s the site for reporting bugs to Apple. When you create a new bug, Apple includes a template in the description for exactly how they want you to report your bug. Apple isn’t looking for you to create your own format or to report things entirely in prose. They also include a handy page of tips for reporting bugs, which you should follow. Create a reductive case of your bug if at all possible. Most likely, you’ll initially encounter a bug in a specific context. For example, I received an email with a fractional street address, and Mail’s data detector chopped off the whole number portion of the address. Rather than report the bug with steps in Mail, I figured that the data detector itself was broken and made a very small Xcode Playground to demonstrate the problem. It’s time-consuming to create reductive cases, but it also reduces the likelihood of confusion. Consider that the person reading and reproducing your bug needs to see it as simply as possible. If there’s no action on your bug, the next step is to mail devbugs@apple.com and request status. Note that it can take a while to get a reply. Filing and following up on getting bugs fixed with Apple is a process, as with anything else. File a Technical Support Incident incident (TSI). This generally will result in a Developer Technical Support (DTS) engineer testing your repro steps. Assuming they can reproduce, generally they’ll track down the correct person to whom to assign the bug. In my experience, often they’ll reverse the incident charge in this situation without even being asked. This is an excellent use of the two TSIs included in your Apple Developer Program membership. If you’re not going to fight for your bug, how do you figure anyone at Apple will? Develop a rapport with DTS and others at Apple. I’ve had several bugs transit a specific DTS engineer. I could email that engineer directly if I felt that would help. I would generally only do so if the process seemed broken somehow in order to get it back on track. Keep in mind that there are vastly more developers than Apple engineers, and please be respectful of their time. I’m quite sure you’ll get farther with brevity, clarity, a reductive example, and by being courteous than you would any other way. If you’re able to attend WWDC, bring your bug list to the labs and track down someone on the team that owns your bug. Talk to them. Open Radar is a great resource. You can search for your bug before filing and perhaps duplicate someone else’s reductive example rather than having to create your own. You can also post your bugs there to help other developers. If you know someone else who is impacted by the same bug as you, let them know and point them to your report on Open Radar. If they can duplicate the bug on bugreport.apple.com, that may help get it attention or increase its priority. Apple’s Developer Forums are another good place to advocate for your bug. The Forums may connect you with other affected developers, or if you’re quite lucky with a DTS engineer or product engineer who can help take up your case internally. Support Stephen Hackett and his children Allison and Josiah as they run to support St. Jude Children’s Research Hospital. Here’s the story. I’m responsible for ensuring that a 72 square foot greenhouse does not cook or dry out the plants within. There are two sets of misters in the greenhouse – the lower misters and the upper misters. The misters themselves are patio misters. The lower misters are below the benches and can be left on for long periods to increase the humidity in the greenhouse. The upper misters are above the benches and must be limited to short stretches, as they get water on the plants, which tend to die if overwatered. 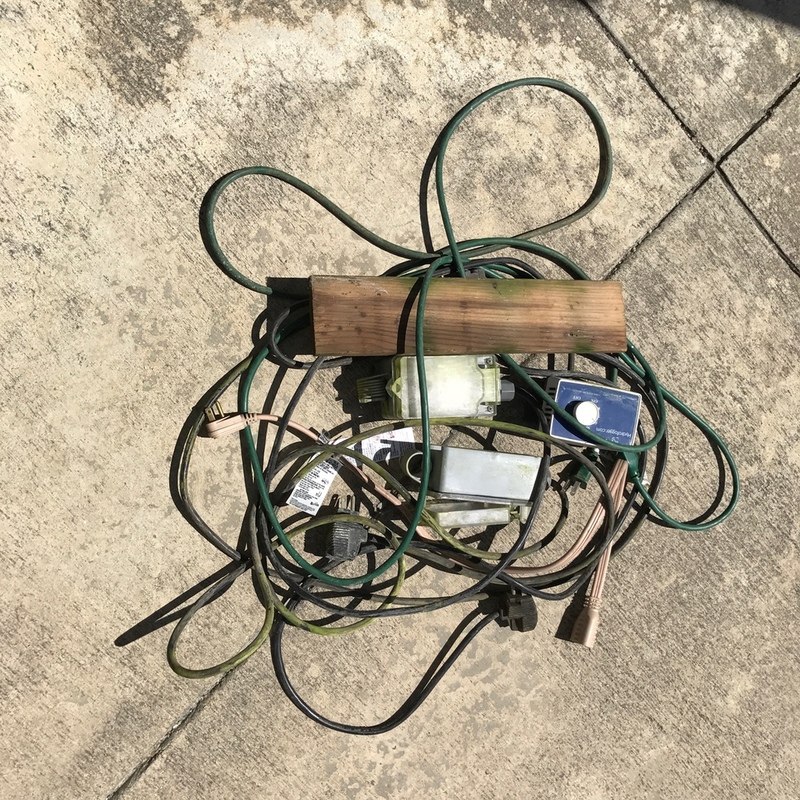 Until recently, I would approximate this using timed valve controllers at the faucet, followed by electrically activated solenoid valves attached to either a humidistat (for the lower misters) or a thermostat (for the upper misters). To limit time of day, I plugged all the electrical components into a mechanical timer. The picture above shows everything except the solenoid valves, which I still use. Enter the El Gato Eve Weather, two El Gato Eve Energy, Apple’s Home app, and the Eve app. I plugged each solenoid valve into an Eve Energy, so now I can control upper and lower misters independently. I put an Eve Weather into the greenhouse, so I’ve got real-time temperature and humidity. I set a Timer in the Eve app to limit when the misters are active (#1), and I set Rules for the lower and upper misters (#2 and #3). The icing on the cake was when I learned that I could set up my AppleTV as my HomeKit hub to monitor and manually control all of this when I’m away from home. HomeKit and El Gato have greatly improved my greenhouse automation, eliminated a pile of fussy equipment, and offered me remote access. Needless to say, I’m thrilled. This is rather fun, and it opens the door to using TextExpander abbreviations for shorthand with an example using a BBEdit Text filter. Stephen Hackett posted a good list of Bad Guesses for the Next macOS Name. Here’s my list of Good Names for macOS 10.13. These are all places in California I can imagine Apple choosing for the next name. Big Sur is one of my favorite places, and it has been badly damaged and partially cut off by landslides from California’s epic rainfall this Spring. 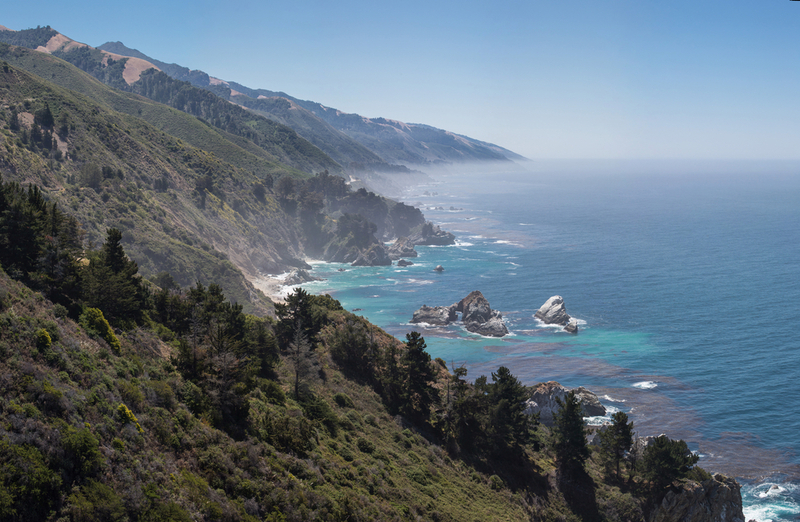 It would seem very much like Apple to choose Big Sur to highlight this beautiful area and bring attention to its current plight. Big Sur has my vote. Fingers crossed. Be careful to do Step 6, as it’s important and easy to forget. That will get you set up with a JSON Feed for your WordPress posts at https://yoursite.com/feed/json. You can check our our TextExpander JSON Feed here. The default feed template lacks a few things I want in our feed, particularly images for posts and icons for the feed itself. These are easy to add using WordPress filters. We maintain a custom plugin for our site for little tidbits of code like this. You could also place such code in a child theme’s functions.php file. The two filter functions provided by the JSON Feed Plugin are json_feed_item for feed items and json_feed_feed for feed metadata. This code includes our OpenGraph image in each feed item. It works with the WP Meta SEO plugin. This code includes our icons and authorship info in the feed. Hopefully, these code tidbits are of some help if you choose to customize your JSON Feed. Feel free to send me some feedback on Twitter or micro.blog. In the age of smartphones with great cameras, we often hear “The best camera is the one you have with you.” I think there’s a parallel for data transfer: “The best cable is the one you have.” Or, the extended version: “The best cable is the one you have, so that you don’t have to order another from Amazon or Monoprice.” Here’s the scenario where this occurred to me. My test machine is an iMac (24-inch, Early 2008) with a 480GB SSD, which I installed several years ago to extend its useful life. Sierra doesn’t support it. I needed to replace it before WWDC brings us macOS 10.13, when I’ll have to install Sierra and probably 10.13 on my test machine. The replacement is a MacBook Pro (Retina, 15-inch, Late 2013). I also have Boot Camp on this machine for testing TextExpander for Windows. Unfortunately, step 2 requires a Thunderbolt 2 to Firewire adapter, and I don’t have one of those. This led me to examine which, if any, adapters I did have. I found a Thunderbolt 2 to Gigabit Ethernet adapter. That was promising. If I had a crossover cable, I’d be able to connect the two machines directly. I checked briefly and realized I had permanently lent my crossover cable some years ago. In order to connect my iMac and MacBook Pro via Ethernet, I’d need a switch. 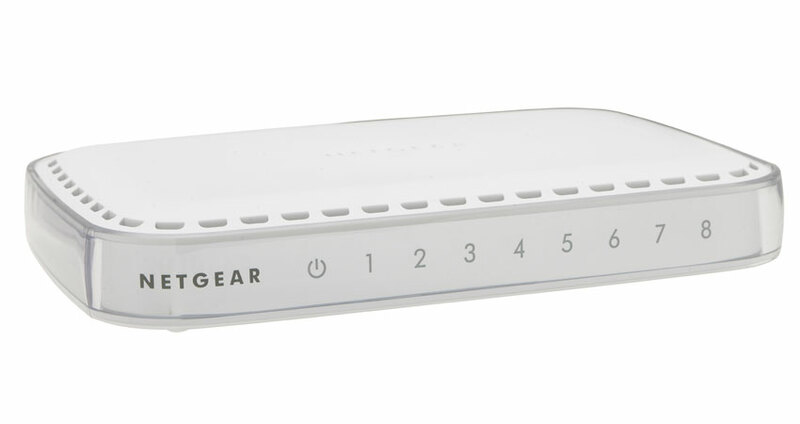 I checked my closet, and I found an old NetGear 8-Port Gigabit Ethernet Switch among Smile’s Macworld supplies (I did mention it was old, right?). My go-to cloning software, SuperDuper from Shirt Pocket doesn’t appear to support cloning to a remote volume. This led me to recall Carbon Copy Cloner and give it a fresh look. Carbon Copy Cloner has come a LONG way from the last time I used it many years ago. Hats off to Bombich Software for a throughly evolved, fantastically capable product. Carbon Copy Cloner includes support for cloning to a “Remote Macintosh”. This involves creating a small installer, copying that to the remote machine, running it, then enabling Remote Login. The process was easy as could be. The software looks great and was very easy to use. Anyone thinking of producing indie software for macOS should consider Bombich Software a role model. When I finished copying my Mavericks, Yosemite, and El Capitan test volumes, I immediately paid my $39 for Carbon Copy Cloner. I may not use it again any time soon, but it saved me the cost of an additional cable, and it allowed me to do what I needed immediately. I sell software for a living, so I’m quite sensitive to paying folks for software which performs a necessary task for me or saves me a good chunk of time. In this case, Carbon Copy Cloner, did both. Thanks! Storage is another area where everything’s amazing and nobody’s happy. I only have to think about storage once or twice a year. When that rolls around, I fire up DaisyDisk, which helps me visualize where I’m wasting space on outdated iOS emulators, leftover disk image downloads, and the like. I delete them, and I’m back to 100GB or more of free space. If you’re doing audio or video production, or if you’ve got a MacBook Air with 64 or 128GB of solid state storage, storage management is probably still a pain point, though a comparatively manageable one. Storage no longer takes significant time away from computing. Let’s think back some years. The permanent storage on my first computer was via cassette tape, which was slow and unreliable. This led to floppy disks, at first 5¼ inch floppy disks which were easy to bend or damage. 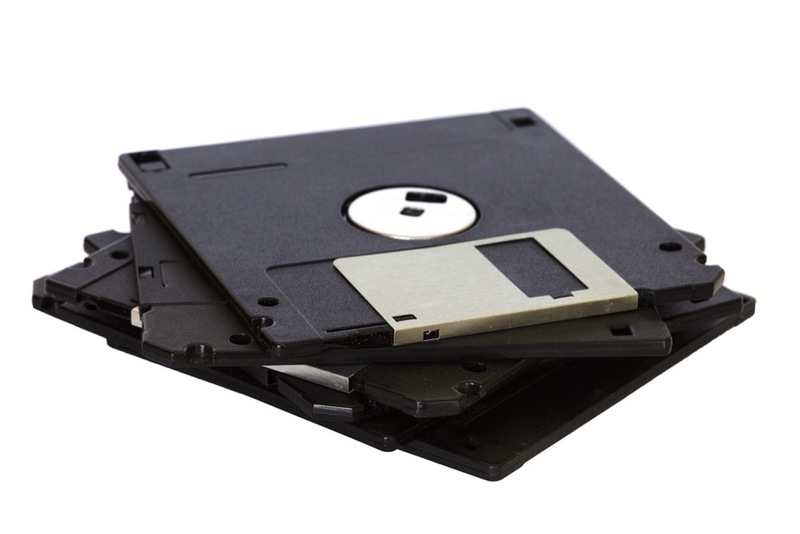 Those gave way to 3½ inch disks with a hard outer shell and the floppy part contained inside. Storage was the constant, overriding concern when engaged in personal computing during the floppy disk era. It wasn’t uncommon to have to swap floppy disks many times in the course of what we’d consider a simple computing session today. Hard drives really changed the game, though at first they were insanely expensive and relatively low in capacity. At first, hard drives eliminated disk swapping during boot or when using a complex application. Most data file storage was still done on floppy disks, as this was the only practical way to transport data from one computer to another. Everyone who used floppies for data storage has at least one horror story of data loss. The most creative one I encountered was a PhD student who put both a 3½ disk and a banana in his backpack only to find that the banana got into his disk, destroying his only electronic copy of his thesis. Such a situation is almost unimaginable today. Hard drives got bigger and less expensive. Email, online storage, and backup programs came on the scene, and folks began to store data files on hard drives. Storage became less intrusive to computing, but storage was still finite, limited, and unreliable. Backups became the replacement intrusion. The revolutionary and short-lived Zip and Jazz drives from Iomega provided high capacity external media. These gave way promptly to cheaper and more convenient writable CDs then read/write DVDs. It became easy to transport large amounts of data and to back up high capacity hard drives. Time Machine and cheaper, more reliable external hard drives practically eliminated backups as a computing intrusion. Enter “the Cloud” and reliable, always-on Internet connections. These obviated the need for physical media to share your own data among multiple devices or multiple locations, to share data with others, and to store backups of critical data. Add cloud-based offsite backup solutions, such as Backblaze, and backups are now nearly 100% reliable. Data loss is no longer an overriding concern in daily computing. Today, we have fast local storage in the form of high capacity solid state drives (SSDs). We have local backup to inexpensive spinning hard drives managed seamlessly by Time Machine. Offsite backup to the cloud ensures that we’re protected from failure of our Time Machine drives. We share data with our other devices and other people via the cloud. Storage has shifted from the overriding concern of daily computing to a background task, which for the most part stays out of our way and lets us get the job done. Considering the path to get here, this is completely amazing (yet still some are not happy). The piece is not without flaws, as I don’t believe the fault lies with a spoiled generation. For me, it does a perfect job of skewering our lack of wonder and joy – our complacency – at the truly amazing things we experience every single day in our modern lives. I think we have a lot of the this in the tech world. It’s easy to forget how far we’ve come in such a short period of time and how amazing that is. It’s easy to lose the joy in long term progress amid current frustrations, which always seem more significant because they’re in the present tense. I thought it might be fun to explore some examples. I realize the relevance of these examples will vary with the age of the reader. At the time I’m writing this, I’m 44 years old – double death in Cantonese. This colors my experience, as readers who are significantly younger started their tech lives with newer and better stuff. Readers who are older will shake their heads at how I belong to a spoiled generation and ought not complain. And so it goes. For my first example where everything’s amazing and nobody’s happy, let’s take networking. Just this week, I read an article about Comcast offering gigabit Internet in four cities. My first thought was disappointment that I can only get 100 megabits in my neighborhood. My second thought was: only?!? It’s absolutely amazing that I do have 100 megabit Internet. I realize that there are many in the US and elsewhere who still run on slow DSL and have less to be grateful for than I. Sure, I still pine for a gigabit connection, and when I get that I’ll pine for even more. But at least now, Mom can share my internet connection without wrecking my downloads. With a few Accessibility twiddles, you can have system-wide dark mode on iOS today. There’s no need to wait for iOS 11 or 12 or whenever. Dark Mode must be one of the most common feature requests for iOS. Open Radar is littered with requests such as this, this, and this which cites an original bug number of 15453121. The first request for system-wide Dark Mode must have originated between November 2013 and March 2014, based on my own bug report numbers. I expect that most folks would like a Control Center toggle for a system-wide dark mode, rather like the toggle for Do Not Disturb. Only Apple can help with that. 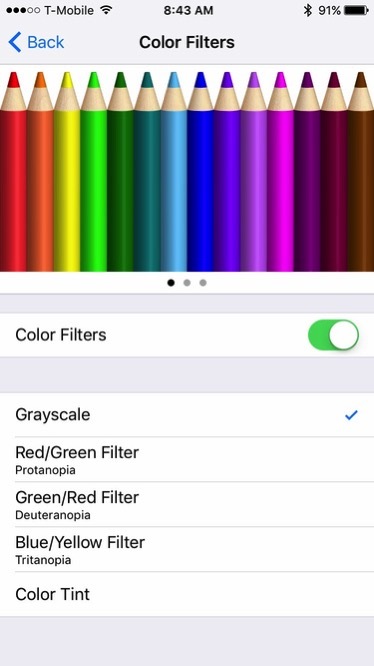 If you’ve played with the color filters for color blindness or tint, then you’ll also need to tap Grayscale in step 4. Once you’ve selected Grayscale, it will remain the selected filter in the future. Sure, it’s a fair bit of tapping, but if you want to use your iPhone in bed without subjecting your bedroom to a bright glow, it’ll do the job. Let’s hope Apple addresses bug 15453121 in a future update to iOS. In the meantime, with a bit of tap patience, you can have what you need. 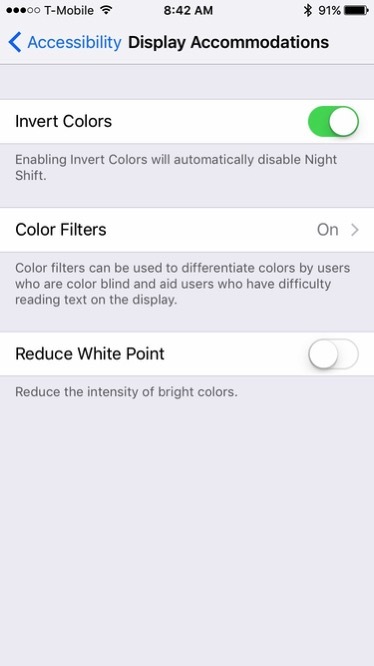 Now, when you triple tap the home button, you’ll be able to tap Invert Colors or Color Filters. You’ll have to repeat the process a second time to enable / disable the other item.